When the occasion calls for a centerpiece that is magnificent, yet easy to serve, our spiral-sliced hams are the perfect choice. And when the occasion is a smaller gathering or family meal, our petite spiral-sliced hams offer all the versatility and flavor you're looking for. Maple-cured, cob-smoked, and maple-glazed with the same great taste and convenience of our traditional sized hams. Fully cooked, just warm and serve. Estimate 1/4lb per person buffet style or 1/2lb per person for dinner, depending on appetites. Use it for a small gathering. 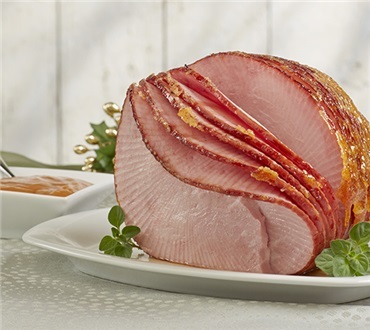 Wonderful meaty, sweet, tender ham, great for 2 persons! Wonderful small ham with great mix of smoky and sweet. Heats well, with complex flavors and not much salty taste (important to me). Instructions were clear and accurate. I trust what comes from Dakin Farms will be products without extra preservatives so I can eat delicious already prepared food.